The past few months have been exciting for followers of the aurora borealis, commonly known as the Northern Lights. Sizable solar storms have produced spectacular auroras that have been visible in a much larger area than usual, including in parts of Pennsylvania. 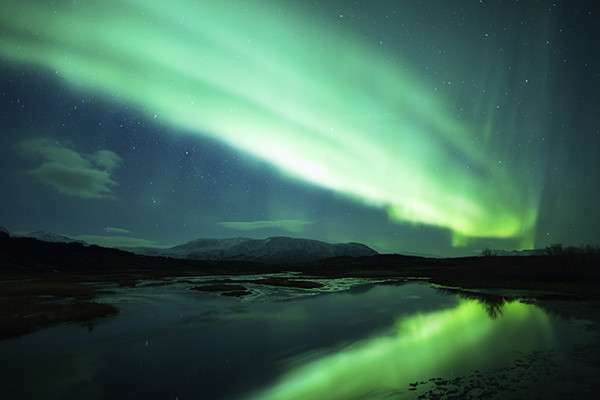 A professor at Penn State's College of Information Sciences and Technology (IST), in collaboration with scientists at NASA, is exploring how Twitter can be leveraged to help people track aurora sightings. "What makes our project different is that not only do we want to help people see the aurora, we want to better science," said Andrea Tapia, an associate professor at the College of IST. Tapia, along with Nathan Case and Elizabeth MacDonald with NASA's Goddard Space Flight Center, is working on the Aurorasaurus project. Run by the New Mexico Consortium based at NASA Goddard located just outside of Washington D.C., the Aurorasaurus project is a blend of space weather, citizen and computer science. The Aurorasaurus website includes a real-time map tracking Earth observations of the auroras via numerous sources, including social media. Using both satellite data and real time reporting through Twitter web and mobile app submissions, Aurorasaurus aims to develop a "now cast" model of when and where the aurora will be visible. Case, Tapia, and MacDonald, along with Nicolas Lalone, a doctoral candidate at the College of IST, collaborated on a paper, "Mapping auroral activity with Twitter." In the study, the use of Twitter as a measure of auroral activity is investigated for the first time. According to the researchers, studies have shown that Twitter users can provide real-time information about large-scale events and disasters such as earthquakes, influenza outbreaks and wildfires. The researchers' study collates tweets and investigates the possibility of Twitter for both real-time analysis and mapping of an aurora, as has been done with other large-scale events such as natural disasters. The tweets used in the study were collected by the Aurorasaurus citizen science project from September 2012 to April 2013. Overall, the results suggest that Twitter can provide both specific details about an individual aurora and accurate real-time indication of when and where an aurora is visible. "The research is significant because it allows us to use Twitter as a data source for aurora sighting and to find out whether it is useful in real time," Case said. The researchers discovered that peaks in the number of aurora-related tweets are frequently found to coincide with geomagnetic disturbances. In addition, they found that the number of daily aurora-related tweets strongly correlated with the strength of the aurora. The auroras, both surrounding the north magnetic pole (aurora borealis) and south magnetic pole (aurora australis,) occur when highly charged electrons from the solar wind interact with particles in the Earth's magnetic field. The solar wind streams away from the sun at speeds of roughly 1 million miles per hour. When particles in the solar wind reach the earth some 93 hours after leaving the sun, they follow the lines of magnetic force generated by the earth's core and flow through the magnetosphere, a teardrop-shaped area of charged particles and magnetic fields. According to Tapia and Case, a recent increase in solar activity has created ample opportunities for aurora enthusiasts to spread news about sightings through social media. Around March 17-19, and again in late June, Case said Twitter was "abuzz with aurora sightings" that were reported at lower latitudes than usual, including in some parts of northern Pennsylvania. "We've actually been quite lucky this year with big (solar) storms," Case said. Currently, Tapia said, "There's really no good way to track the aurora at all." Aurora sightings are predicted based on measurements from the ACE satellite on the strength of the solar wind as it heads toward Earth. But the satellite sits less than a million miles from Earth, so scientists get very little warning of activity, usually no more than an hour. "The irony is if it's a really strong storm, the satellites stop working," Tapia said. While Twitter can be an effective tool for predicting aurora sightings, Tapia and Case said, it also has its limitations. For example, soft sensors from multiple countries might report sightings of the same auroral event. Additionally, since an aurora can occur over a wide range of longitudes and time zones, the same auroral display may only become visible in certain regions hours after being visible in others. To improve their model of aurora "nowcasting," the researchers are using citizen science and crowdsourcing. Since there are "hundreds of aurora enthusiast groups to alert each other" about sightings, Tapia said, she and her colleagues are building an alert system to let people know if other people in their area have seen the aurora. In addition, Tapia said, they would like to "boost the educational components" of the Aurorasaurus website. "It's kind of a basic primer on space weather science and that is only going to grow," she said.